The purpose of this research is to analyze the factual model of school partnership with parents through social media in school-based quality improvement management in SMA Kristen 1 Salatiga and result in the development of school partnership model with parents through social media in school-based quality improvement management in private high schools. It is Research and Development (R & D) research. Data collection techniques used interviews and documentation studies. The development phase is done through (1) Potential and Problem, (2) Data Collection, (3) Product Design, (4) Design Validation, and (5) Design Repair. The results showed that SMA Kristen 1 Salatiga had run the family education program quite well. Several activities in the family education program at the school has been implemented before the schools get funding from the government partnership program. Schools have also begun to seek the use of social media as a means of strengthening communication with parents and other stakeholders, but nevertheless in its development in the field of management has not been maximized. The researchers also found no model formulated by the school associated with this family education program because the new school programmed the partnership into a family education program within one year. The product of this research is a school partnership model with parents through social media at a private high school equipped with guides for the implementing parties. Armansyah. 2009. Peranan dan Pemberdayaan Komite Sekolah Dalam Pemberdayaan Pendidikan SMA Negeri Kota Binjai. Medan: Universitas Sumatera Utara. Cox, Daniel Dean. 2012. "School communications 2.0: A social media strategy for K-12 principals and superintendents". Graduate Theses and Dissertations.Paper 12301.Iowa State University. Daryanto, Farid. 2013. Konsep Dasar Manajemen Pendidikan di Sekolah. Yogyakarta: Gava Media. Gelgel, I Nengah. 2005. 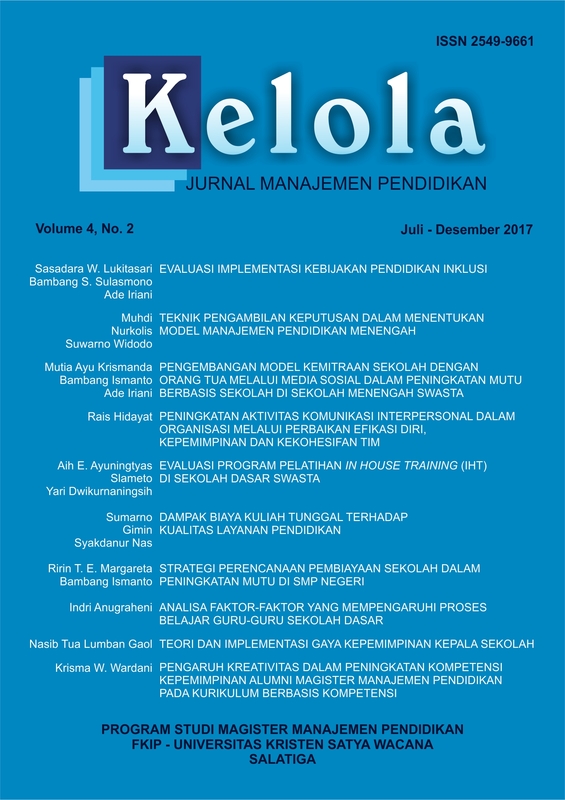 Evaluasi Kinerja Komite Sekolah Jenjang Sekolah Menengah Pertama (SMP) Di Kabupaten Buleleng Tahun 2005. IKIP Negeri Singaraja. Greenfield, D.B. (2003).Parent Involvement Project. http://www.psy.miami.edu/ faculty/dgreenfield/research/parent_involvement.html. Havard Family Research Project, 2002. Family and School Together: Building Organizational Capacity for Family School Partnership. Havard: Havard College. Havard Family Research Project, 2007. Family Involvement Makes A Difference: Evidence That Family Involvement Promotes School Success For Every Child of Every Age. Havard: Havard College. Kementrian Pendidikan dan Kebudayaan. 2015. Petunjuk Juknis Penguatan Kemitraan Keluarga, Satuan Pendidikan, SMA/ SMK. Larasati, S.Y. 2009. Peran Komite Sekolah Dalam Meningkatkan Mutu Pendidikan Di SMA Ronggolawe Kota Semarang. Semarang: Universitas Negeri Semarang. Prastawa.H, dkk. 2010. Pengembangan Hutan Pinus Masyarakat Berbasis Kemitraan Sebagai Model Pemberdaya¬an Masyarakat Sekitar Hutan. Jurnal Teknik Industri, 11/2, Agustus 2010: 178–183. Rodliyah. 2013. Partisipasi Masyarakat Dalam Pengambilan Keputusan dan Perencanaan di Sekolah. Yogyakarta: Pustaka Pelajar. Rosita, Tita. 2009. Pengembangan Model Pola Pengasuhan Berbasis Keluarga di Panti Asuhan Dalam Meningkatkan Kreativitas Seni Anak (Studi Deskriptif Tentang Pengasuhan Di Kinderdorf SOS Desa Taruna Lembang. Bandung: Universitas Pendidikan Indonesia. Slameto. 2015. Manajemen Berbasis Sekolah (MBS). Salatiga: satya Wacana University Press. Syaifudin, M. dkk. 2006. Manajemen Berbasis Sekolah. Jakarta: Dirjen Dikti.